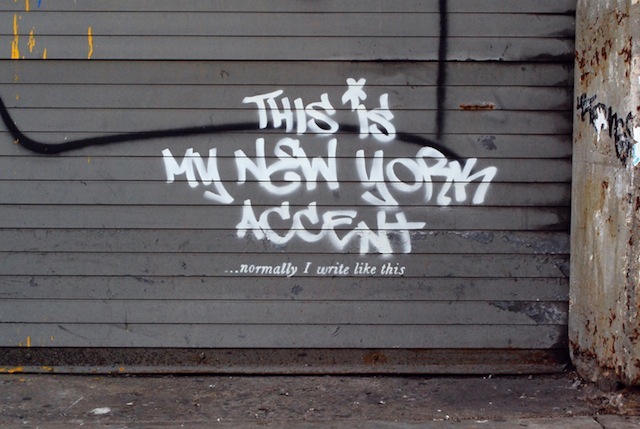 Yesterday, we chronicled the debut of Banksy’s monthlong “residency” in New York, which launched with a piece on the Lower East Side consisting of two children reaching for the spray can in an official-seeming “Graffiti is a Crime” sign — and a toll-free number stenciled like a footnote nearby. The new day brought with it a second Banksy, but now that amusing audio guide hotline appears to be down, and overnight the first piece went through a graffiti metamorphosis of its own. The inaugural work in this Better Out Than In series was first defaced by other artists (a new “Street Art is a Crime” sign replacing the original, credited to Smart Crew, was the most substantive change), then the whole thing, errant tags and all, was buffed. The buffer’s bludgeon missed the hotline number (1-800-656-4271) stenciled on an adjacent wall, though after calling it repeatedly throughout the morning, it appears that the line is either down or overwhelmed with calls. As a result, today’s text-based work, located somewhere on the west side of Manhattan according to the artist’s website, remains without the wryly edifying audio companion. In addition to chronicling the works in the Better Out Than In street “residency” on his website, whose banksy.co.uk URL now redirects to banksyny.com, Banksy has also set up shop on Twitter and Instagram. There is, of course, an official hashtag: #banksyny. UPDATE: Animal NY is reporting that the piece is on West 25th Street between 10th and 11th Avenues. UPDATE 2: RJ Rushmore of Vandalog has raised some reasonable doubts about the authenticity of the Twitter account, so there’s that. UPDATE 3: The toll free line is back up, but there does not seem to be an audio guide entry for this second piece. View all our posts release to Banksy’s Better In Than Out show in New York throughout October here.